BELLINGHAM –Thanks to the coordination of community partner Whatcom-Farm-to-School, local farmers have visited elementary schools to share their experiences of growing food. This is part of a broader effort on food education in schools and cafeterias, sharing where food comes from, how it is grown and how it is prepared to eat. 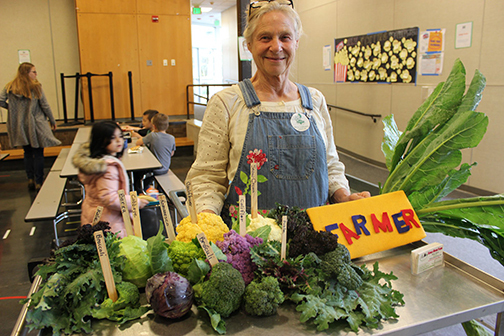 In late October, Helen Solem of Sumas River Farm (pictured) took some time away from her Whatcom County organic farm to visit with students at Cordata Elementary. Timed with the October Harvest of the Month, she brought with her a variety of cauliflower and broccoli from her farm. During her visit, students asked questions about being a farmer and the crops she grows. In December, Giana Wakim of The Crows Farm visited Birchwood Elementary School and gave out samples of chives and talked about alliums in general, a plant genus that includes onions, leeks, garlic and shallots. In other news, Bellingham Public Schools’ Director of Food Services, Chef Patrick Durgan, and Wellness Director Jessica Sankey will present at the Community Food Co-op’s Annual Meeting & Party on March 30. They will share the district’s “Good Food Promise” and the great changes the district is making to improve school food.